There was a moment towards the end of 2016 when I realized one of the most important events in all of human history was nigh. That’s right, Hollywood was providing the moviegoing public with both a King Kong AND a Planet of the Apes movie in the year of our Lord 2017. For anyone else who goes to the zoo and stares at the apes all day this was super exciting. Monkeys are awesome, especially when they’re causing wanton destruction and killing people. 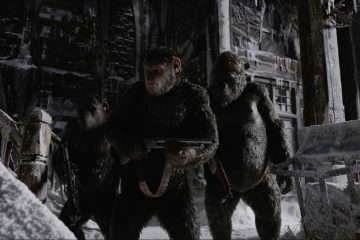 In the final installment of the modern Planet of the Apes trilogy (preceded by Rise of the Planet of the Apes and Dawn of the Planet of the Apes), we see Caesar (Andy Serkis) dealing with his role as leader of the chimpanzees/gorillas/orangutans who have created a new society in the Pacific Northwest. Immediately, a human military faction led by Woody Harrelson captures a handful of apes and kills Caesar’s family. On a mission of revenge, Caesar and a few other apes go to attack the human military base, while the rest of his village heads to a new safe haven away from humans. War for the Planet of the Apes barrels through familiar genres as it moves from somber Western to prison escape film to war/action film. As we discover that the disease that wiped out most of the humans is evolving, there’s an inevitability to the eventual triumph of the apes, further tying this into the original five films from the 60’s and 70’s. Kong: Skull Island, on the other hand, is less concerned with continuity (if there’s a reference to a giant gorilla falling off the Empire State Building several decades earlier, I missed it). Set in the early 1970’s, this thinly veiled Vietnam War allegory concerns a group of scientists and soldiers heading to a mysterious island in order to prove the existence of monsters and judge what threat, if any, they could pose to the civilized world. After a breathtaking sequence where Kong wrecks all of their helicopters, the large group is separated and forced to fight off various giant animals who seem hellbent on killing them. 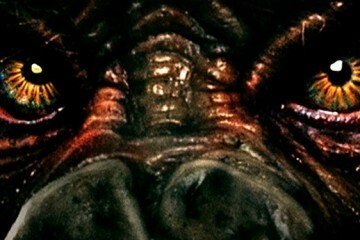 Eventually, they encounter a tribe of natives (and a WWII veteran played by John C. Reilly) who explain that Kong protects them against reptilian monsters called Skullcrawlers who live just under the surface and occasionally pop-out to cause chaos. 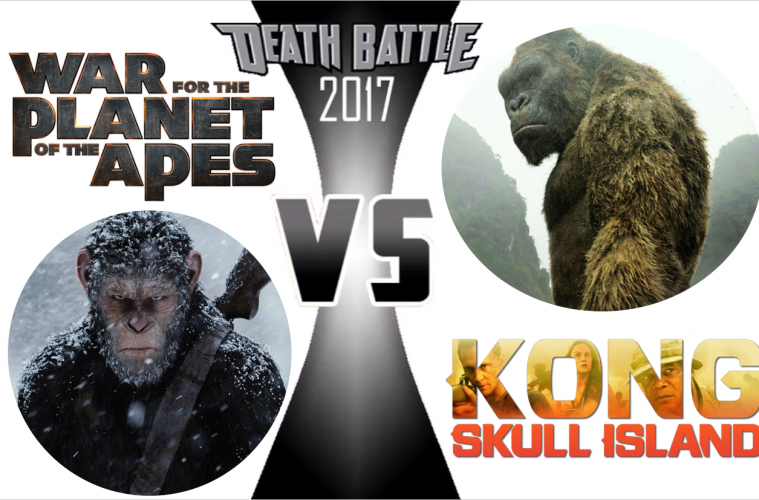 Which, of course, teases the long-awaited climactic battle of Kong versus Skullcrawlers while humans run around underfoot. In War for the Planet of the Apes, Andy Serkis reprises his role as Caesar; the leader of the hyper-intelligent apes who are poised to become the dominant species on Earth. As usual, he crushes it and continues to redefine how we think of an actor’s performance. In that light, Karin Konoval returning as wise orangutan Maurice and Steve Zahn as the emotionally defeated Bad Ape continue his tradition of imbuing motion capture performances with human emotion. Woody Harrelson also shines as The Colonel, who does for his character what no other actor portraying a human has been able to do over three films: provide nuance. Coming into this, it’s hard not to realize how STACKED Kong: Skull Island‘s cast is. Unfortunately, Tom Hiddleston, Brie Larson, and personal favorite John Goodman are all wasted on flat characters who have no purpose outside of pushing the story forward. 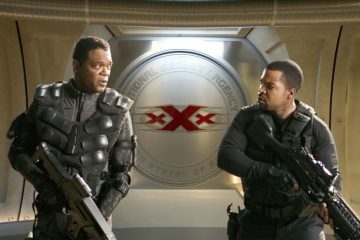 Samuel L. Jackson’s Lieutenant Colonel Packard is just as thinly written as these, but as the villain, he’s at least slightly more interesting and Jackson puts forward a profound menace that gives a logic to his misguided vengeance against Kong. And while not reaching the heights of Serkis, Zahn, or Konoval (or even his own performance as Koba in Dawn of the Planet of the Apes), Toby Kebbell has an untamed intensity as Kong, but is unable to do anything with his boring human character (I guess he fares better than all the other disposable people who show up). 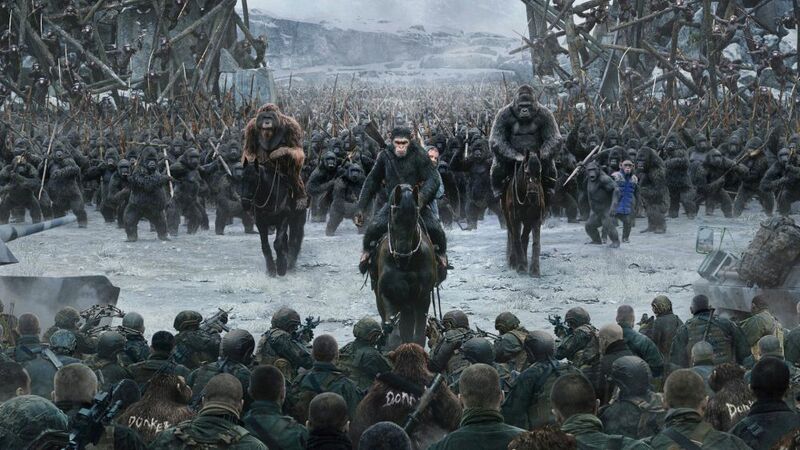 War for the Planet of the Apes‘ strengths come in how it sheds the necessities of blockbuster filmmaking in order to create something that feels pure and natural. The criticisms of the past two films often came to the thin human characters and what felt like obligatory action bombast (for example, the wild assault on the humans in Dawn of the Planet of the Apes is great, but the climactic showdown between Caesar and Koba isn’t quite intimate enough). Here, there is no pretense of human characters the audience is supposed to care for, which provides room to give Woody Harrelson’s villainous colonel depth and really put the focus on Caesar. Meanwhile, the way this sequel treats its action beats is almost subversive. There’s a big opening, then almost no setpieces for the next hour or so, an exciting prison break, a few explosions, and a climax that totally zigs when you’d expect it to zag. Visually, Kong: Skull Island is vibrant and frenetic in a way that I’m not sure any other movie was this year. The ad campaign really leaned into some of these images that frankly helps cement the shots as iconic. And it’s not just cinematographer Larry Fong’s digitally enhanced colors and framing. 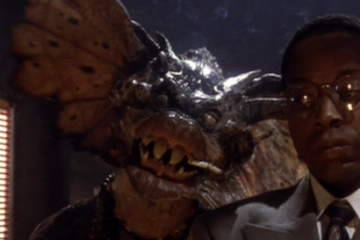 During some of the action scenes, there are pulpy camera tricks that call to mind some of the showier and engaging gags of Sam Raimi. Hell, this is a PG-13 giant ape movie that references Apocalypse Now, several different anime sources, Taxi Driver, and Cannibal Holocaust. What all this does is serve a purpose. Kong: Skull Island isn’t scared to go hard into a nearly cartoonishly violent spectacle. 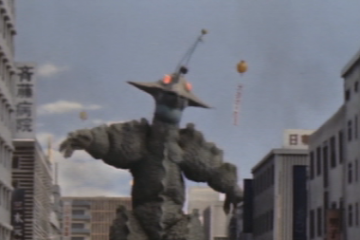 Once King Kong decides to do something like ripping the branches off of a tree so he can use it as a baseball bat or swing an ocean liner’s propeller around on a chain, it’s clear that we’re watching the WWE version of King Kong. This is gorgeous gorilla pandemonium from the top ropes, and in a year that also saw high-concept dramedy Colossal, it makes sense that further demystifying the awe and wonder of a giant monster movie is the right decision. At risk of “spoiling” the winner of this monkey movie showdown, I’m not sure what there isn’t to like about War for the Planet of the Apes. At worst, it can feel a touch too sober and restrained, especially when compared to the previous two entries. Dawn of the Planet of the Apes had a wild-eyed bonobo shooting two machine guns simultaneously while riding a horse for Pete’s sake. All the action sequences here are more concerned with character than excitement, so even the exceptional early scene of a human assault on the ape base of operations gives us a patient view of the consequences related to the action and gunplay. For literally any other movie, “The action scenes are thoughtful” would be one of the strongest thing in its favor. In this case, this also isn’t a criticism, but it’s me simply acknowledging that it’s difficult for this sequel to live up to the adventure promises of the rest of the series. I mentioned it in the “People Who Get Paid to Talk” section above, but the character work in Kong: Skull Island is weak. And it’s a shame because the movie’s just so gosh darn fun outside of that. Sure the Vietnam War metaphor is muddled and sometimes the bombast feels a little too dumb, but Jordan Vogt-Roberts succeeds in setting up the gonzo tone of the film and keeping it going. In fact, his self-criticism of the narrative issues of the movie in the below episode of Honest Trailers is probably much more eloquent in pointing out the film’s flaws than I ever could be. Unsurprisingly, War for the Planet of the Apes takes it. Despite the opening assault and final showdown, this is almost an anti-action movie. And the fact that it still manages to be fun as it goes out of its way to upend expectations is part of the reason it’s so successful. 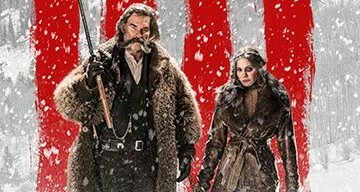 Possibly the best Western since 1993’s Tombstone, this final chapter in Caesar’s story puts a poignant bookend on what has proven to be the most consistently great trilogy of all time. On the other hand Kong: Skull Island was better than it should have been and I find myself pulling up YouTube and re-watching two of the central action scenes (the helicopter fight and the Skullcrawler fight) on a semi-monthly basis. But War for the Planet of the Apes is the full package and has the emotional core that often elevates good genre films to great genre films. Strong performances, a thoughtful story, and perfect visual effects make this easily the best monkey movie of the year (and one of the best non-monkey movies as well). 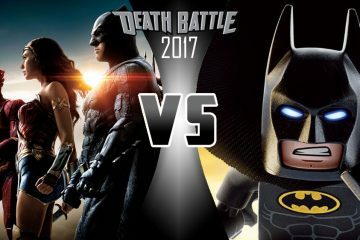 Previous ArticleDUELING MOVIES 2017: WHICH WAS THE BETTER 1980s-STYLED SEQUEL? 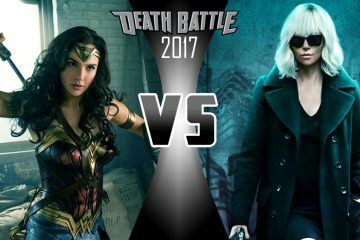 DUELING MOVIES 2017: WHICH IS THE BETTER ‘JUSTICE LEAGUE’ MOVIE?